There are not very many western hair bottles in color. Here are three of the earliest colored examples. The Fish's is well known, and documented as well as quite rare. These date from about 1864. There are no other bottles quite like them in regards to mold type, and they represent western glass history at it's finest. The Henley's Indian Queen is also quite early and date to the 1869-73 time frame. This product must not have been a big seller as there are less than 10 in collections. They come in both blue and green colorations, and have been found exclusively in Oregon and California. I am not aware of any examples being found in other western states. I have also not seen any advertising for this product. 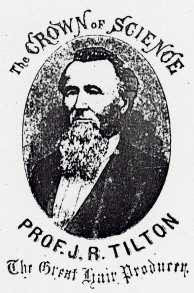 The Tilton's is a bit later ( mid 1870s) and was put out by Dr. Joseph Tilton of San Francisco. he was "physician" there from 1874 through 1889. The words " Crown of Science" and "The Great Hair Producer" were registered in 1874. These bottles come in both blue, and occasionally aqua. I believe there are about 25-30 in collections, and they have been dug in California and Oregon. There are a few other western hair bottles in color such as the St.Clair's Hair Lotion, and the Fountain of Youth, which may or may not be western. Hair bottles are a category of their own, and represent some of the most colorful glass ever blown. There are comparatively few western colored hair's than from other parts of the US. I believe they were blown in brilliant colors to avoid being ingested accidentally. I want to thank Don Fadely for his exhaustive research and study of these beautiful pieces of history. St. Clair's Bay Laurel Hair Lotion was trade marked by Henry Bowman, of Sacramento, on 10 October 1871. While the bottles have that rather unusual tooled finish top, as does the Fountain Of Youth, they nevertheless date from the 1870s. This is proved by the age of the pits where they are commonly found. I have dug both the SC and FOY in the same pit on more than one occasion. Later I will post the claim of TM by H. Bowman. There is also an extremely rare version of the St. Clair's that is Western blown. It has an applied lip, whittled, clean crude sparkly glass and is lighter in color similiar to a Dickey. I’ve only seen one. It’s a completely different mold than that of the Eastern blown and exhibits all the characteristics of a early S.F. blown bottle. I have seen the example that you are referring to GP...I missed out on it when it showed up on the net several years ago. I have a photo of it somewhere and it is a large 8 1/2 " size and as you mentioned, the medium saphire blue color. Definitely western blown where the regular large and small size St. Clair's seem to be eastern cobalt that etches and stains.Maybe when I come over to see your collection again, it can be viewed :) Dale M.
I ditto Mike on the age of the ST Clairs and Fountain of Youth. I've dug both as well, and they seem to come out of mid to late 1870's pits, with the St Clair's sometimes showing-up as late as early 1880's. Many Eastern blown bottles, especially the meds, seem to be tooled earlier than our Western counterparts. could you post a photo of the western blown variants of the st clairs and FOY ? ?